Q: Is it possible to sign a PDF document using PDF Studio? 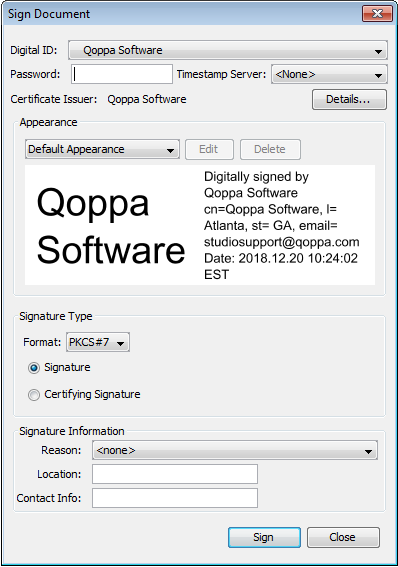 A: Yes, PDF Studio offers multiple ways to sign PDF documents. Apply an Official Digital Signature (Pro Only) – This method is the most secure and accepted form of signature. It requires a pass worded digital certificate to be created prior to being placed on the document. Once placed on the document the document can no longer be edited in any way or the signature becomes invalid. Below are the descriptions of each option as well as how to create each signature. Your first time signing a document you will be asked to either import an existing ID or create a new one. Follow the on screen instructions to complete the process. It will ask you where to save the signed document and then your document is now signed. Draw a Signature with the Pencil Annotation – You can hand-draw your signature using the drawing annotation tool. This will allow you to use your mouse (or touch screen) to draw your signature as you would with a pen. NOTE: This signature can still be removed or edited once placed. Save the document and now you have signed the document. 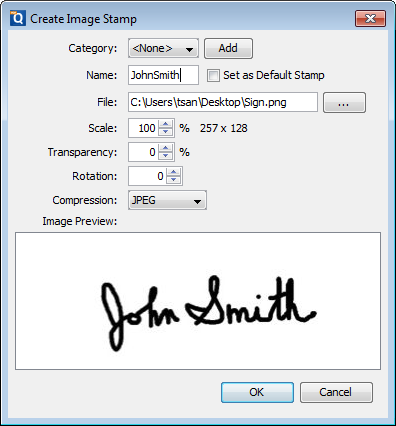 Import your Scanned Signature as an Image Stamp – You can use either the Image Import function or Stamp tool to place a scanned image of your signature directly on the document. For this it is best if you have a PNG file with a transparent background of your signature. NOTE: This signature can still be removed or edited once placed. Place the signature where you need it on the document. You can resize the signature to make it fit where you need. Save the document and your document is ready to be sent. In the following window set the options for the stamp.